Seriously - it actually started off in the toilet! My youngest dropped a toy in the pee filled toilet and I had to grab it out of there trying to avoid getting the toilet paper stuck on my hand! Sooo gross! I've also had to take water balloons out of the toilet, carrots, and shoes! 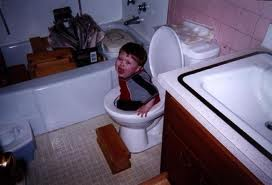 Why are kids so fasinated with toilets? I try to only go to them when I have to actually go to the bathroom. I don't like to hang out by the toilet, jump on the toilet, or play with the water in the toilet! I don't even like to throw up in the toilet! (just the thought of my face so close to .... well you know... makes me want to puke right now!) But kids, they love them! I'm surprised they haven't come out with actual play toilets to put on the playground or something. They would be the most popular toy of all! Until some drunk guy came along and peed into it. Honestly, I am done with the fasination with toilets and all things related to them! My days should not revolve around toilets! On a side note, one of the worst things ever is when I have gotten up in the middle of the night and Ry has left the toilet seat up. I am half asleep so I actually fall into the toilet! That will wake you up fast! Or have you ever gone into the public restroom and shifted your weight a little to only have it automatically flush on you and your rear end gets all wet! So disgusting! 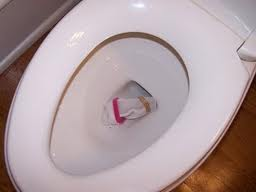 I really don't like toilets!